Every time Dreams Tonite plays on CHUO 89.1 FM it catches my ear. I can't say that for every song on this album - they are all good songs and some real stand outs for me include Hey, Lollipop and Forget About Life. ALVVAYS is a hard working band with roots deep in the east coast of Canada. They make good music and toured extensively over the last few years. 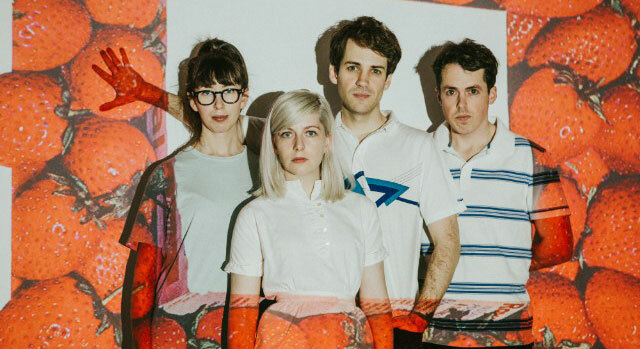 Antisocialites, the second full length from Toronto based Alvvays, draws on all kinds of inspiration – from 90's era brit pop, 60's guitar pop to dream rock and back to power pop - and they do it well. Antisocialites is littered with quirky lyrics and great stories. This album is a perfect follow up to their self titled debut. Like his earlier records, the music on Mac DeMarco's third album, This Old Dog could easily serve as the soundtrack to a lazy, summer road trip. The songwriting and overall style is unmistakably his - slow and sunny melodies with warm, laid-back vibes. Indeed, DeMarco plays all of the instruments on the album, and also produced and engineered the record himself. But with closer listening, the lyrics tell a different story - one of heartache and sadness. The songs seem deeply personal, and touch on some difficult subjects like how to say goodbye to a long absent father, or the crumbling of yet another romantic relationship. For a slacker rock record, you might think that this level of heavy introspection could kill the mood. Yet the songs, which are mainly acoustic guitar and synth-driven, never lose their relaxed and mellow feel. With This Old Dog, Mac DeMarco has something to say, but he's in no hurry and you might as well enjoy the ride. Future Politics represents a more pared down electronic sound for Austra that matches a more sombre lyrical mood. Leader Katie Stelmanis’s readings in science fiction and treatises on capitalism and climate change informed the writing and recording of the album and are reflected in its themes. Although written before the US election last year, Future Politics was released just a Donald Trump took office but retains and essentially optimistic outlook looking towards solutions rather than just problems..
Austra’s last album, Olympia was number 1 on the !earshot Top 200 of 2013, I think we can expect to see them here again in the Top 10 the next time around. Timber Timbre’s 6th album, Sincerely, Future Pollution is another darker record made for these strange times. Lead singer and songwriter Taylor Kirk and his band have crafted a somewhat dystopian vision of our world. The dark and brooding feel is further developed with the introduction of old-school 80’s-style synths and drum machines. to their usual folkie sound. It is a shift in sound and tone that shows Timber Timbre continuing to growth and evolve in ways that keep fans coming back. Edmonton Alberta's Faith Healer's 6th release but first LP as a duo entitled Try ;-) is a playful, vulnerable collection of songs. The album is rife with jangly lo-fi indie pop. The video for the title track is weird enough to draw you in but it is the music that keeps you there. Try ;-) pulls no punches – it is well crafted guitar riffs, reflective song writing and beautiful vocals. But don't be fooled Jessica Jalbert is no one trick pony, there is an unmistakable Blues influence on 2nd time. And Sufferein' Creature is a perfect 60's infused garage pop song. The album is easy to put on repeat and discover new depths each time. 80 Run The Jewels Run The Jewels 3 Run the Jewels, Inc.